This is our Annual Bunny Ball celebrating Easter and a Bon Voyage Party as Kevin & Vinny flies to Barcelona on Easter for a Southern France Group Cruise. 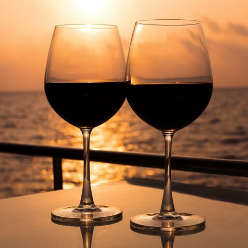 Pair some Easter candy and wine in preparation of the Easter Bunny's arrival and be sure to to send your best wishes as Kevin, Vinny, Faith and Tom head off to Europe for our 7 Night Cruise in Southern France. We all start out in Barcelona and will end up in Paris. Be sure to follow our trip progress while we are gone via our social media and web sites. As soon as we get back from this trip, we will be announcing our 2020 group frip. So become a Ferret Traveler next year for a whole new exciting experience. This is our Annual Bunny Ball celebrating Easter and a Bon Voyage Party as Kevin & Vinny flies to Barcelona on Easter for a Southern France Group Cruise. Pair some Easter candy and wine in preparation of the Easter Bunny's arrival and be sure to to send your best wishes as Kevin, Vinny, Faith and Tom head off to Europe for our 7 Night Cruise in Southern France. We all start out in Barcelona and will end up in Paris. Be sure to follow our trip progress while we are gone via our social media and web sites. As soon as we get back from this trip, we will be announcing our 2020 group frip. So become a Ferret Traveler next year for a whole new exciting experience.